handling | Why you drive bad?! 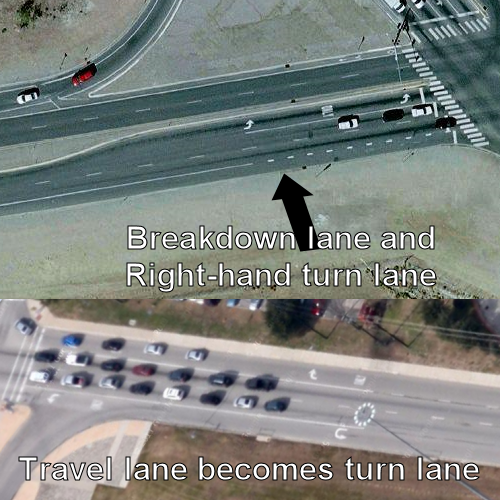 The difference in RH medians and turn lanes. Both examples have 55 MPH speed limits. One thing I’ve noticed is a lack of auxiliary right-hand turn lanes around here. It seems like the right through lane just becomes a mandatory RH turn lane or you take your chances of getting rear-ended turning right. This wouldn’t be such a big deal if there were also a breakdown lane between the RH through lane and the curb. It seems like they only make the road wide enough for all travel lanes so the edge of the asphalt ends a few inches past the white line. I’m still slowly adjusting to it as I’m used to having a few feet of asphalt between the travel lane and the curb. I keep thinking “I’m driving where cars park!” when I’m driving so close to the sidewalk. It’s also troublesome to make a RH turn when I’m on a 55 MPH “highway” (which used to not have stops before the area became populated and traffic lights were installed instead of lowering the speed limit). Sometimes I really wonder when I’ll be rear-ended by an inattentive driver. I usually end up squealing my tires taking a sharp 90 degree turn while slowing down from 55 and hoping I don’t plow into something from the understeer. Drive it like it is! I was headed downtown and I need to take a fly-over to connect to another highway. I am behind a new Mini and the driver slows down to 40 MPH for the curve in the interchange. I’ve previously taken this curve at the speed limit (65 MPH) in my car fine. My car is a full-size American sedan with no hint of sportiness at all. Now a Mini can out-handle and out-run my car like a cat outrunning a brick on Jell-O. I don’t understand why this person felt the need to slow down so much for an interchange designed for highway speeds. Sure the illusion of the curve makes it look a lot sharper than it actually is, but it is safe. It’s very sad that people can afford to buy such capable vehicles, but drive it like it was an ’78 Chevy Chevette. I’ve seen people do more strenuous maneuvers with lesser cars. If you’re that scared to drive, get off the freeway!